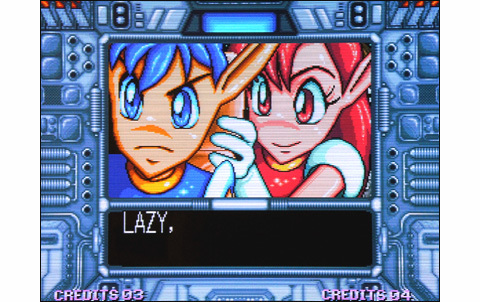 Man... My favorite gaming system will never end surprising me. 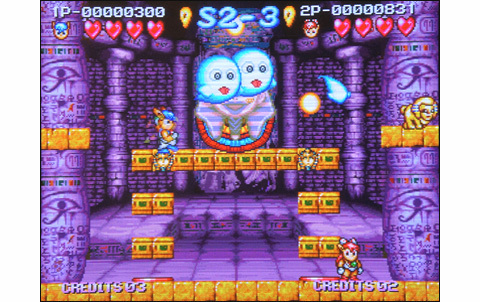 A Neo Geo game prototype made in 1994 being released in 2010, six years after the official commercial extinction of the machine? One would think that Santa Claus exists! 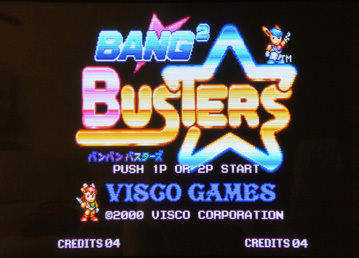 Neo Conception International, a new videogame edition company, managed to get the Bang Bang Busters rights, a videogame project remained on the shelf of the japanese publisher Visco. 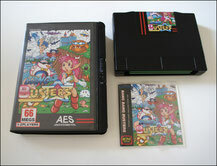 These guys lead out the project, and the game finally makes it to the market... Is this baby worth it? For if Visco has not marketed it, there must be a reason! First observation, having not been a fan of the japanese insert design, I was pleasantly surprised by the "Euro/US" release. The tragedy is avoided for this one (see for yourself). But let's now get serious, as what made us come here is the review of the game itself! 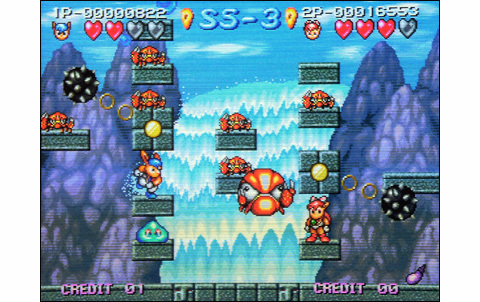 After choosing your favorite character (Lazy or Refia), you come to a cute kinematic with our heroes in their space ship, landing on the planet Palua. Seven zones await players, broken down into numerous levels. Ice, green forests, towering waterfalls, castles, evil mountains, Egyptian pyramids... What a world! 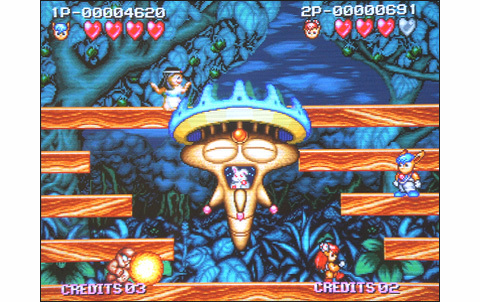 With such diversity, the no need to say the backgrounds are varied and the graphics exotic! 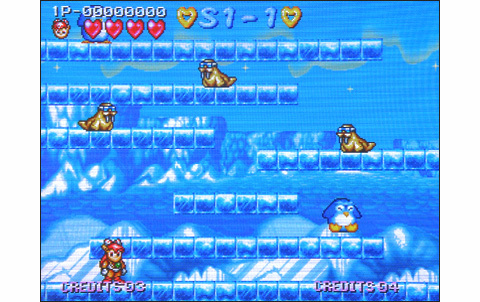 Within each area, the background changes from one level to another, either in the manner of Fatal Fury (morning, afternoon, evening) or with several different designs. 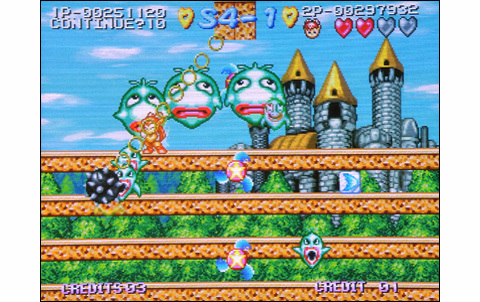 These are neat and colorful as well as the enemies, who in addition to being cute and numerous, are simply hilarious when they're inflated like balloons! As for the Bosses, they're original and have a nice size. 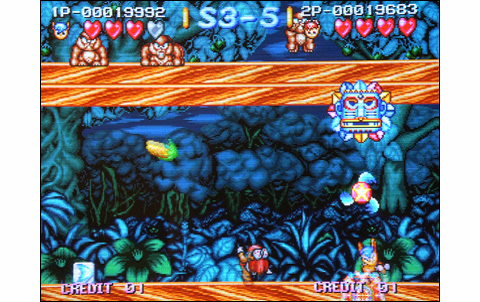 Without competing with the finesse or the opulence of some Neo Geo hits, graphics prove a nice tweaking, and clearly rivalizes with official titles such as the pretty good Zupapa and Nightmare in the Dark. 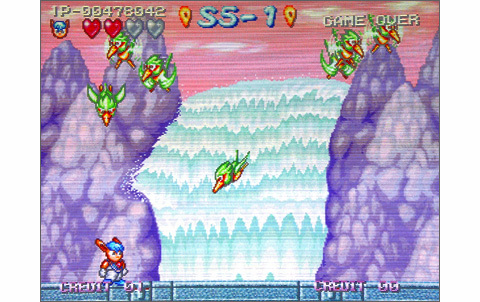 The animation is speedy, the enemies on the screen are sometimes very numerous without causing any slowdown, and the various characters moves and other elements are made of a good range of animation steps, and benefit many nice details (dust during jumps, sparks, colored ribbons). However it's less flexible and decomposed than in Nightmare in the Dark, which I mentionned before. 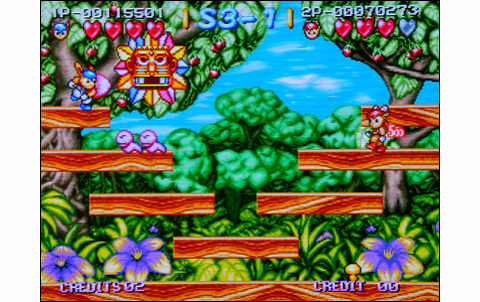 The soundtrack creates a nice atmosphere, complete with vocals, explosions, shocks, air noises and other exotic sounds. As you see, overall our Bang Bang Busters does good with its realization, but it's no big surprise in this regard. That said, what interests most players in such kind of games is the gameplay and of course, the replay value. 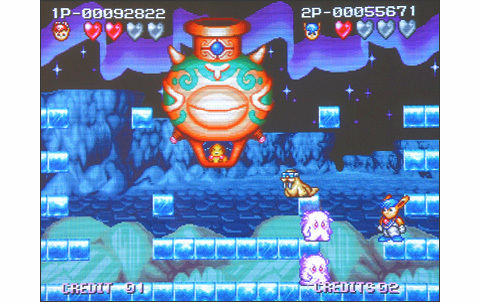 B2B offers a total of forty-two levels part of seven different worlds, which is the same number as Zupapa, packing an amount of nine worlds instead. 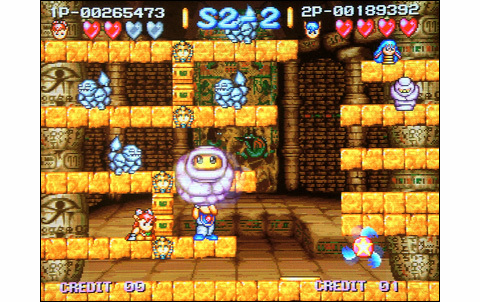 We have to consider that Zupapa levels are longer and more difficult to clear, and that each world has its own Boss! In fact, in B2B worlds two and four have no Bosses, which is such a shame. 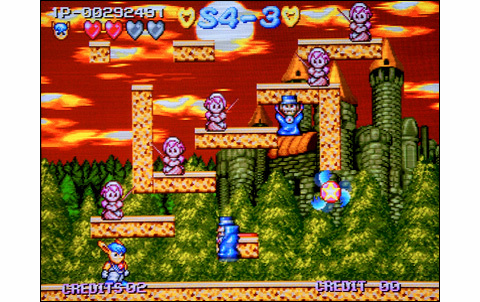 The game is therefore a bit shorter than SNK's one, but the challenge is still honorable! Clearing it within the allowed credits stands as a tough task, and I don't tell you about the 1CC... Good luck! 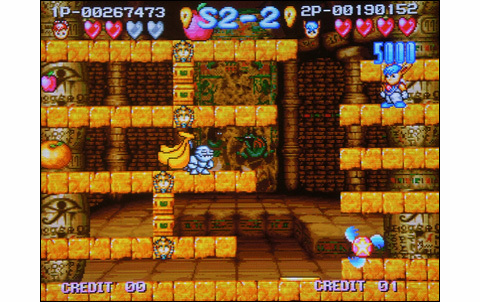 Bang²Buster's gameplay is definitely its strong point. 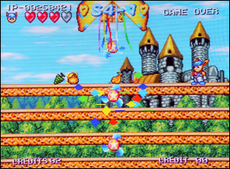 The method for killing enemies is original and fun: once fixed and inflated with helium by hitting the A button, you can swing enemies and unleash them on their mates, making superb strikes! While inflated, they also allow you to fly temporarily: just catch one and hit several times the B button. 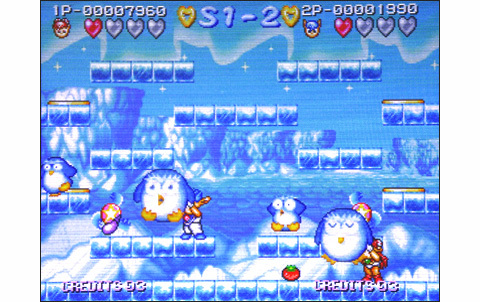 The controls are quite complete, including the dash (forward twice), direct throw (dash + A with the enemy) and power up on several levels for speed, power and range of shots. Of course, tons of bonuses and other surprises await you during the missions, and the race for score will be spicy! B2B is a game that keeps all its promises. To be honest, I wasn't expecting such quality on a prototype left to oblivion by its creators. 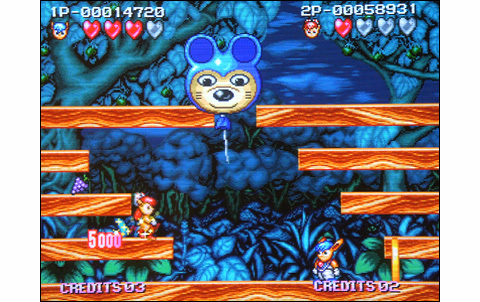 The game would have had its own place in the Neo Geo games library back then, which lacks platform games. Visco's soft offers a nice realization, a decent replay value and an excellent gameplay. 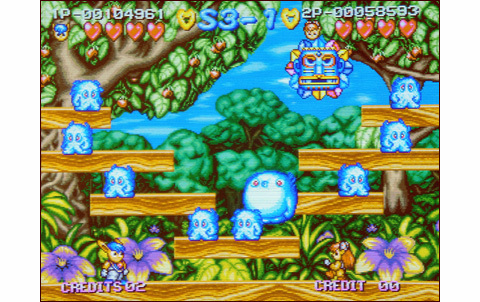 Far from surpassing the big titles in this section, Bang Bang Busters is still a great little game with an interesting challenge and a funny cartoonish atmosphere. Childish and simplistic, but delicate and varied... Good job! Characters are correctly animated and move fast. No slowdowns at all, even when the screen is heavily loaded. Sympatic themes and very good sound effects. 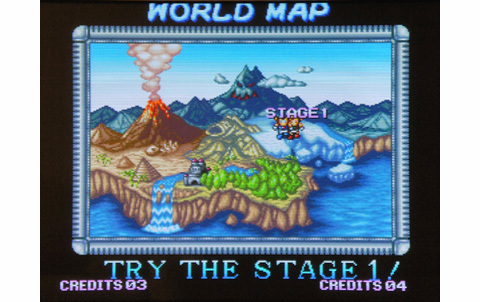 Forty-two levels on seven stages and good difficulty: nice! 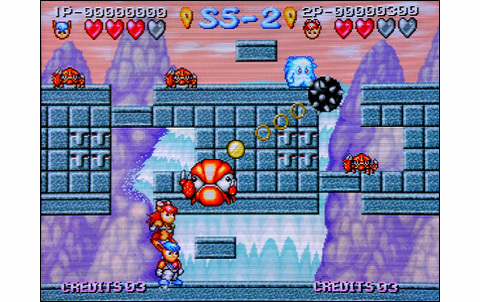 We deplore the absence of real Boss in the second and fourth worlds, and some stages too easy to clear. Fun as hell for two players, the game makes you undeniably come back for more. Gameplay is complete and fun, the pleasure you have playing B2B is worthy Zupapa or Nitd! 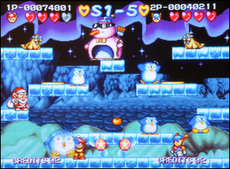 What a nice surprise: a fun and well-made platform game, in addition to Zupapa and Nitd! Bang²Busters is doubtlessly a very good investment (plan to spend at least 500 euros anyway) but if you're purely thinking in a "player" point of view, it's nowhere near a good deal. On the Neo, you'll have more for your bucks with Nightmare or Zupapa.